San Francisco is not just the destination for tech workers, hipsters, and cable car enthusiasts. This year a host of wild ocean animals have moved in to San Francisco’s lesser-known western suburbs, following swarms of baitfish, particularly anchovies, who remain surprisingly indifferent to real estate prices and commute times in the city. To find whales in the Pacific west of San Francisco, usually we have to get miles offshore to find the equivalent of a whale watcher’s gold rush: pods of feeding humpbacks, reveling in the bounty of the California Current. 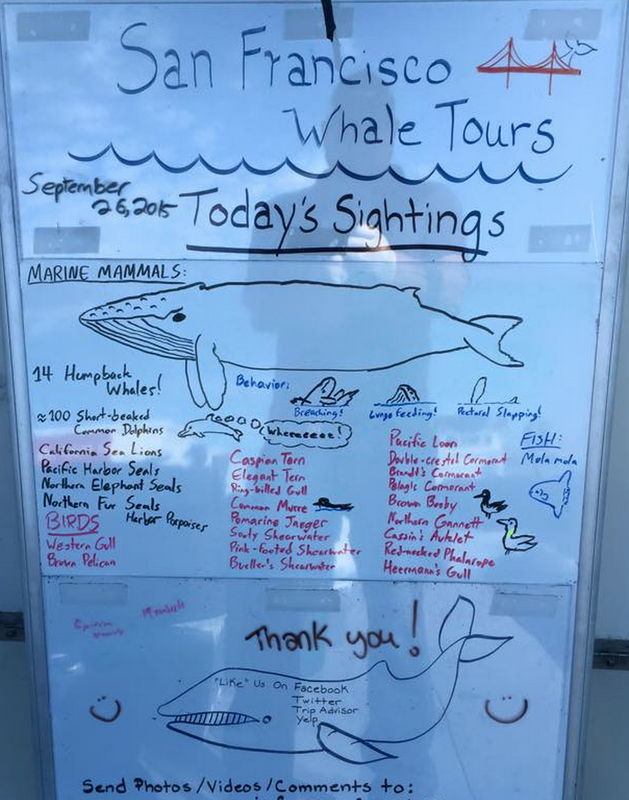 On September 26th, 2015 we had left the dock less than an hour before the spouts of humpbacks announced their presence. One of San Francisco’s other most famous residents, the summer fog, is evident in the photo. I posted this photo in black & white because the color version is essentially all grey, and filtering it in black & white improved the contrast a little. 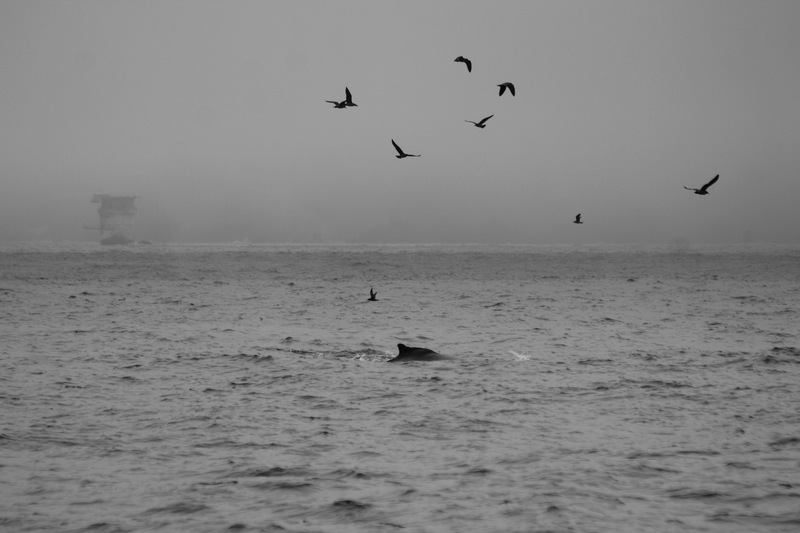 Despite the fog, finding feeding humpbacks within a mile of a major city is pretty exciting, and this whale was part of a group of at least four humpbacks feeding right at the surface at the entrance to the Golden Gate. 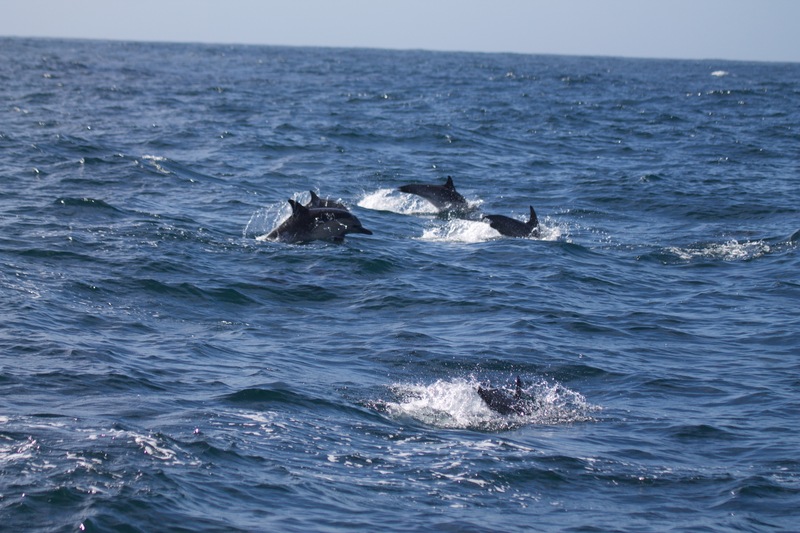 Members of a pod of short-beaked common dolphins (Delphinus delphis) found about 25 miles offshore of San Francisco, just east of Southeast Farallon Island. September 26, 2015. The real star of the show, a large (somewhere around 50-100 animals) pod of short-beaked common dolphins, showed up just as we broke clear of the fog and overcast a few miles east of Southeast Farallon Island near San Francisco. They undoubtedly stole the show, playing in the boat’s bow wave, and showing off their high-speed porpoising (leaping clear of the water as seen in the photo… it’s called that regardless of whether the animal doing it is a porpoise or not) skills. We don’t often get to spend that much time with dolphins, and it always makes a trip worthwhile. Trip species list for September 26, 2015. Missing from the species list, but also present, were Parasitic Jaegers, and we may or may not have also seen a Long-tailed Jaeger! Ann Leckie’s Provenance – where is Ingray coming from?